Toolbox For Strava Awarded With 2nd Place At The Strava Developer Challenge! 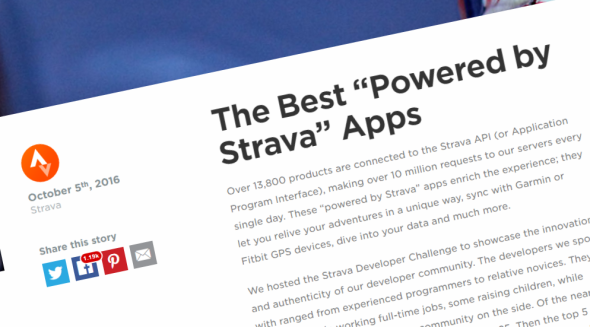 This September, I took part to a competition promoted by Strava, the world famous sport tracker and social network for athletes, to showcase the innovation and authenticity of the developer community using their API. Of course I joined this Developer Challenge with my personal project, Toolbox For Strava. Of the nearly 100 submissions, the Strava team created a shortlist with the top 25. Then the top 5 were selected by Ben Lowe, creator of the amazing VeloViewer; Mark Shaw and Mark Gainey, Strava’s CTO and CEO; and Ariel Poler, a member of Strava’s board of directors. On October 5th, the winners were announced on the official Strava blog and Toolbox For Strava was awarded with the second prize! This is a great news for my project, because of the high visibility generated by the blog post and subsequent buzz on the social networks: in a couple of days, the connected users jumped from about 34K to over 40K! I will also receive a Garmin EDGE 520 (cool, I was thinking to buy it…), a jersey signed by Ted King and a free Strava Premium membership for one year. A personal thanks to all the people supporting the project with ideas, suggestions, donations, beta-testing and encouragement: your appreciation represents for me a fuel to spend part of my (rare) free time in growing Toolbox For Strava. So, stay tuned and be ready for new features: I’m working on them!